"656. 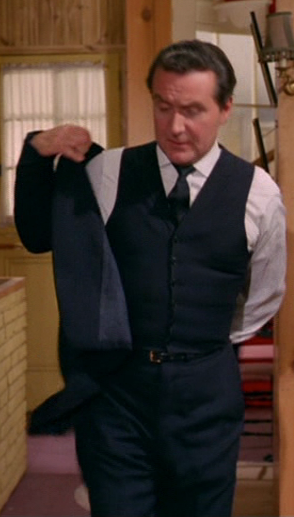 Patrick Macnee "John Steed" suit worn in The Avengers. 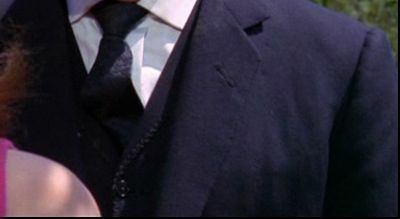 (Associated British Corp., 1961-1969) Dark blue suit worn by Patrick Macnee in his role as the dapper secret agent "John Steed" in the Season 5 episode, "Escape in Time" in which Steed and Peel (Diana Rigg) have to stop a mad scientist who creates a time machine. 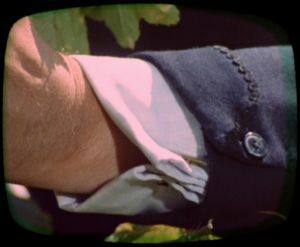 The suit consists of a jacket, waistcoat and trousers all with internal Hammond and Boyle Ltd., London labels with Patrick Macnee's name as well as the date "20-8-66". 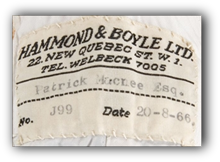 A fantastic original wardrobe item from this popular series"
It was the navy blue three piece suit worn by Patrick Macnee as John Steed during series 5 of The Avengers tailored by Hammond and Boyle Ltd., 22 New Quebec Street, W.1., London; inside labels with Patrick Macnee's name and the date "20-8-66". Object offered by 'Profiles in History', a company who has alternated between the two main third party providers that compete for this business, iCollector and LiveAuctioneers. On 17th December 1992 London auctioneer Christie's offered a suit worn by Patrick Macnee during The Avengers. 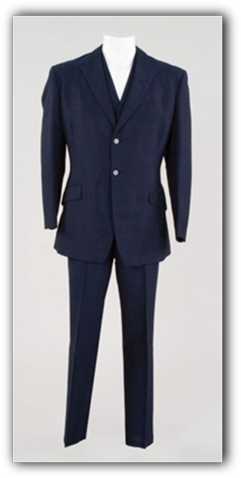 A suit of navy wool mixture, the jacket with turned back cuffs with rick-rack braid, jacket and trousers with manufacturer's details Hammond and Boyle Ltd 22 New Quebec St, W1 on woven labels, each printed with artist's name Patrick MacNee Esq, order number K.28253 and date 9-65. Purchased by the vendor an employee at Elstree Studios in circa 1969-70, after the filming of The Avengers television series." The description matches John Steed's suit from series 5 episodes The Return of the Cybernauts and Escape in Time. On 5th-6th June 2009 Heritage acuctions.com offered and sold (price unknown) a gray two piece suit of Patrick Macnee; tailored by Airey & Wheeler, Ltd., 129 Regent Street London, SW3 for "Patrick Macnee, Esq.". An ink written (delivery?) date says 1/4/1977, but the auctioneer's site mentioned that it was the gray suit worn by Patrick Macnee on promotional shots for The Avengers. "Patrick Macnee's Suit. A custom-tailored two-piece gray suit with light herring bone pattern, owned and worn by Macnee. The suit bears Regent Street's Airey & Wheeler, Ltd., tag along the inside lining of the jacket with "Patrick Macnee, Esq." written on it in ink, and is accompanied by a b&w 8" x 10" photo of Macnee wearing it while posing with his Avengers co-star, Dame Diana Rigg. In Excellent condition. " 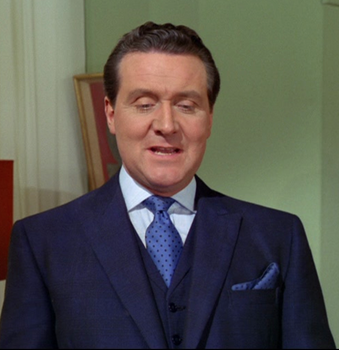 During the last decades several suits and bowler hats (and umbrellas) worn by Patrick Macnee as John Steed during The Avengers and The New Avengers were sold in auctions. Death's Door & Return of the Cybernauts & Who's Who?? ?